Not all is what it seems when a beautiful couple fall in love in the sleepy coastal town of Bayside Cliff. Tim Stevens and Sophia Andrews had it all — paradise, love and a bright future. That is, until Sophia can no longer live with her dark secret — a secret so ghastly that she ultimately takes her life. Years pass when bereaved fiancé Tim receives Sophia’s belongings after her father passes away. That is when he uncovers the dreadful, horrifying truth, that propels Tim to seek justice on his beloved’s behalf. Closure is a dark story about twisted deeds, evil men, and love lost. on a wild ride of shock and awe. Timothy Stevens seemed to have it all working as an attorney, living on a luxurious yacht and being engaged to a beautiful, orange haired beauty named Sophia Andrews. That is, until the day she took her own life. So many questions left unanswered, until the time Sophia’s father passed away. Timothy came into possession of Sophia’s journals of poetry and such, which gave him the clues that he needed to uncover the truth of why she felt the need to take her life. Cotter has a writing style which takes situations that on many levels might seem ordinary (heading to the deli for a sandwich or even taking a drive) and flushes them out by creating layers of subtext and deeper meaning. Closure is loaded with tense intrigue as Tim is suddenly confronted with an unexpected situation that he never anticipated. Anger and revulsion lead Tim to dig deeper into his beloved’s life and discover the gruesome details behind her dark secret. Using poetry and flashbacks, Cotter creates a deeper appreciation for the characters that face truly tragic personal calamities throughout the story. The key is portraying Tim and Sophia in the light of average people. Emma, a large fawn mastiff, plays an elemental role in the story as she becomes Tim’s confidant and a great source of affection. Placing her characters in unusual and life-changing circumstances, the reader can easily appreciate the feelings and dilemmas that arise. While the character’s choices might be considered questionable to the average reader, no one could totally understand why they do what they do unless they were in the same situation. What makes Closure stand out from the standard thriller genre and make it dramatic is Cotter deepens the story to explore the character’s inner thoughts and feelings. The reader is led through this character’s transformation as he contemplates life and decides which course to take as he seeks vengeance among those responsible for Sophia’s demise. Closure is a fast-paced thriller that delves into deep emotions, betrayal, rage, and revenge. What happens in Closure will stay with the reader long after the last page is turned. 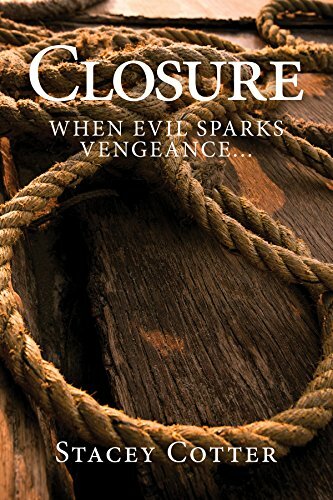 Closure, when evil sparks vengeance… is an intriguing must-read thriller. It released nationwide on October 14, 2017. What is the novel Closure, when evil sparks vengeance… about? Closure is a thriller that involves a young man coming to grips with challenges that life has thrown in his direction. Timothy Stevens seemed to have it all working as an attorney, living on a luxurious yacht and being engaged to a beautiful, orange haired beauty named Sophia Andrews. That is, until the day she took her own life. So many questions left unanswered, until the time Sophia’s father passed away. Timothy came into possession of Sophia’s journals of poetry and such, which gave him the clues that he needed to uncover the truth of why she felt the need to take her life. Anger and revulsion led Tim to avenge his love’s death and bring those responsible to justice. Closure was a thriller that I had always been playing around with in my mind. I hadn’t finalized the storyline or the characters the way that I had conceived, thus I held it close to the vest until now. I’m pleased to have Closure be my third published novel as the time is right and the story is exactly where I want it to be. Decades ago, I took great solace in writing poetry and found the delicate character of Sophia Andrew’s as one that needed to communicate her feelings through verse. Being able to combine poetry into the novel was an element that I found so defining as an author. My character, Sophia Andrews, was taken to another level as her words spoke volumes and allowed her to speak even though she wasn’t present. Who is your favorite character in the Closure and why? The story is centered around our lead character, Timothy Stevens, who I would deem as my favorite character in Closure. This is my first novel writing from the man’s perspective, which I found challenging yet greatly rewarding. Being a relatable and likeable young man, I felt that it was vital for our main character to be someone that we could all relate to in one way or another. The great passion and love that Tim felt for Sophia is apparent throughout the story and in his mission to avenge her death. I’m in hopes that the reader relishes an uninhibited ride that may make them question what they might do in the scenario that our character is thrown into. My goal is for them to experience the same range of emotions: shock, anger, passion and vengeance. Closure, is the type of novel that allows you to escape the day-to-day stresses of life, and take you into another person’s life of challenge and personal discord. This book is your third novel. What are your plans for the future? Writing Harris Estate, Harris Estate – The Aftermath and Closure has opened up a door that I had always kept securely closed. Taking the risk and finally jumping in to writing with both feet, has freed my imagination and put it into overdrive. Since the decision was made to publish, I have gone ahead and written several more stories. Harris Estate will be a trilogy with the final installment Harris Estate – The Next Generation, coming out next year. Finally, The Faithful One, is an in-depth philosophical novel that takes symbolism to another level and offers the reader a way to analyze their lives and how they live it. That is currently in the works and more are coming to mind each and every day. Stacey Cotter has a degree in psychology and business administration, which led her to a career path in long-term healthcare and pharmaceuticals. With a passion for literature, several stories had been in her mind for years, but weren’t ready to come out until recently. Stacey lives with her husband, two children and canines. Thanks to the publisher I have 1 e-copy to give away! My interest is definitely piqued– would be so happy to win a copy of Closure. This sounds interesting and different. I’m often curious what would make someone feel the need to take their life. Wow. I can’t wait to flip the pages and get to the end of this drama with revenge in mind. It looks like an emotional roller coaster and I don’t know if and when my head will stop spinning.